The biggest boon and scourge for any bookstore just might be… storage space. 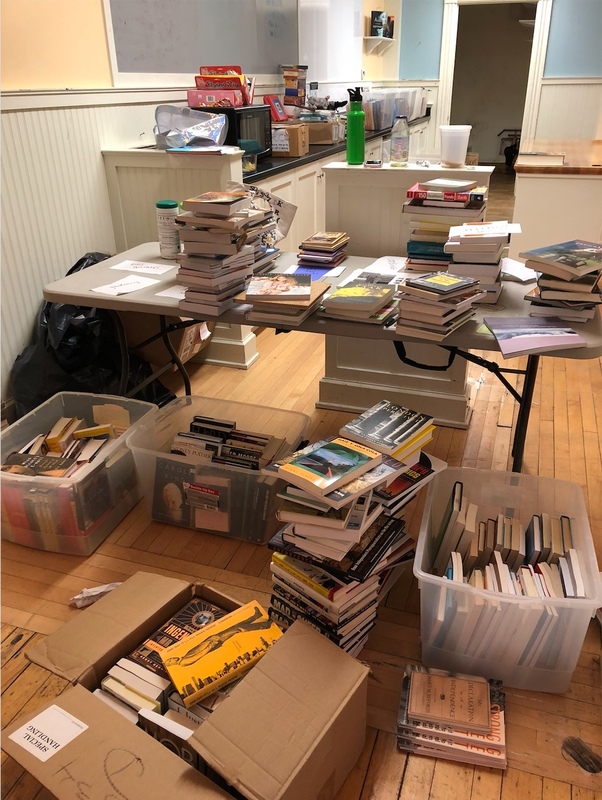 What starts off as a godsend—room for book fair and author event boxes! a staging area for store reorganization efforts! square footage for excess sidelines! a waiting corral for sections out of current favor! a place for lucite spinners and counter displays not in the current rotation!—can, over time, become a coral reef of accreted detritus. We moved into our current location in 2006, and I swear, there are boxes in our basement that came with us in the move and haven’t been opened since. That is, until Jory. After a month and a half of prep—Jory, Liza, and Laura going through boxes, sorting items, etc.—we were ready. Since the space next door to the store—most recently a butcher shop—has been empty for a few months, our landlord said yes to letting us use the space to house the sale. That made all the difference! We could create a mini sale store without crowding our own space with boxes and bins. Looking crazy at 10:30 pm the night before the sale. At last we were ready! 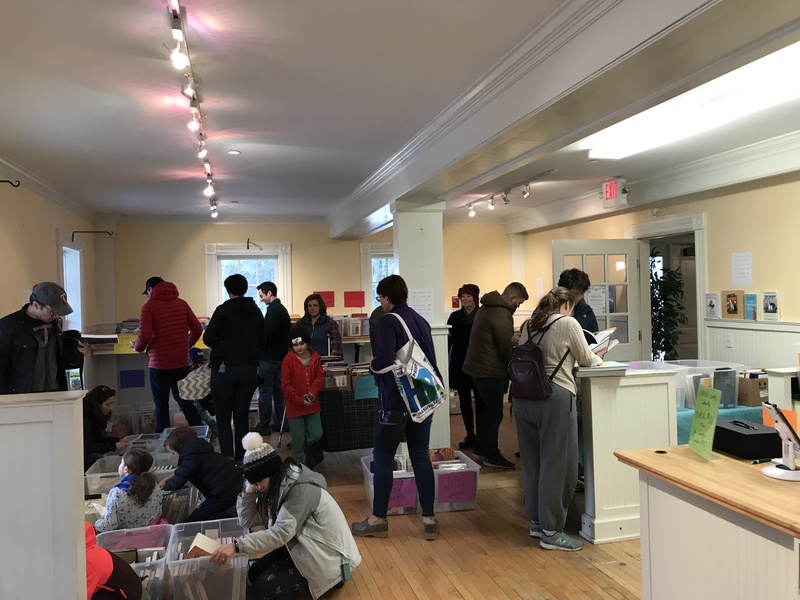 On Saturday morning at 8 am, teachers flooded the sale space for Jory’s homemade scones and some good ol’ Box of Joe coffee from Dunkin’ Donuts, and the Great Pig Book Sale was off and running! It was a smashing success! 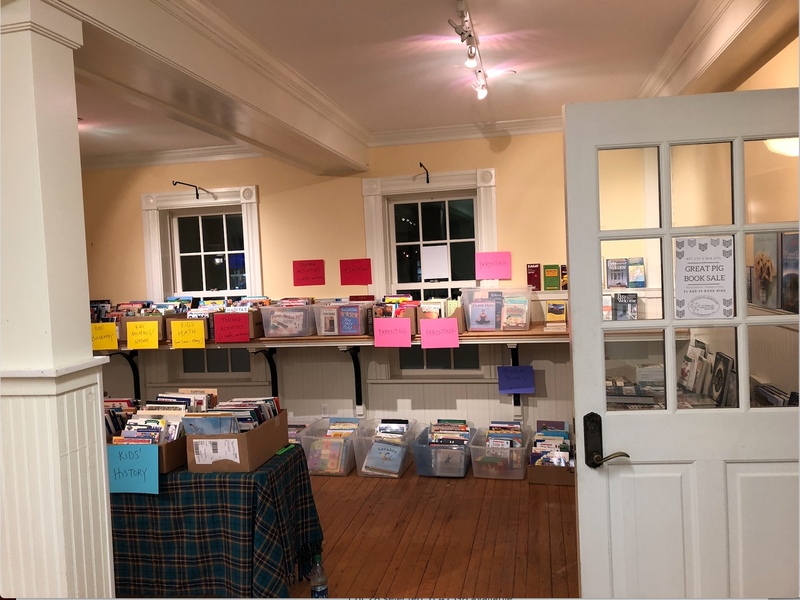 Books that had been languishing in storage for eons found new homes, and customers were thrilled with library-sale-style pricing that made it easy to walk away with stacks of new goodies. Or even just one good one. The only unanticipated issue was that one or two customers who had never been to our bookstore before thought this WAS the store. Yikes! Can you imagine? 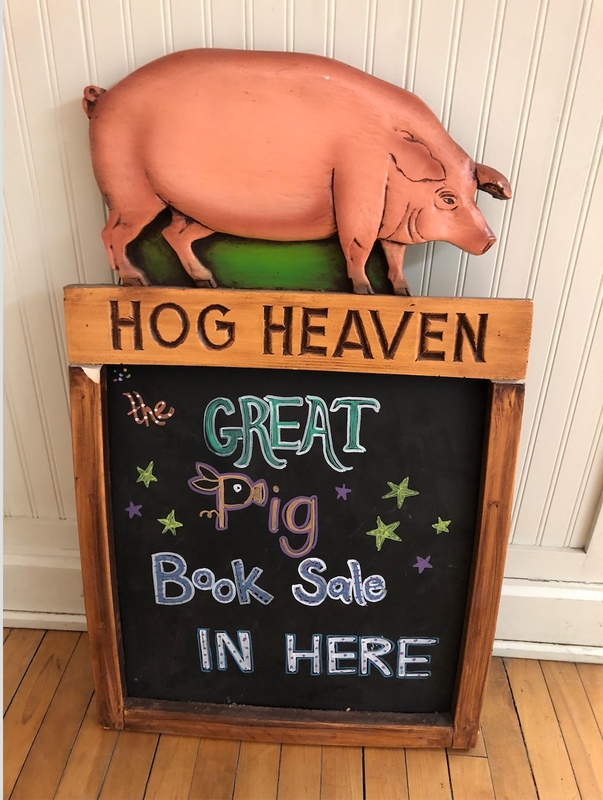 “We operate out of plastic bins and cardboard here at the Flying Pig.” No, no, we told them, please visit our real store next door. And, fortunately, they did. 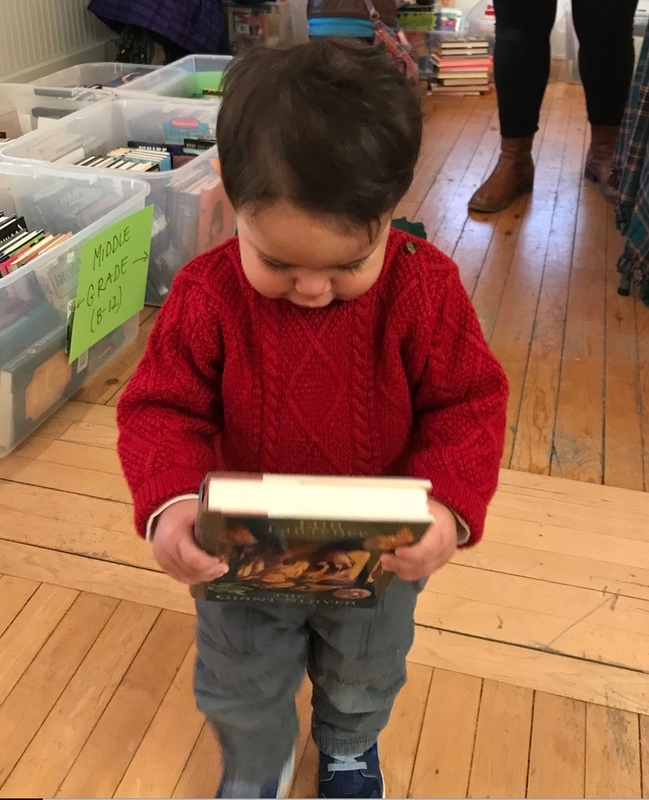 More than 1,000 books found new life beyond storage. And that, my friends, is something to celebrate. 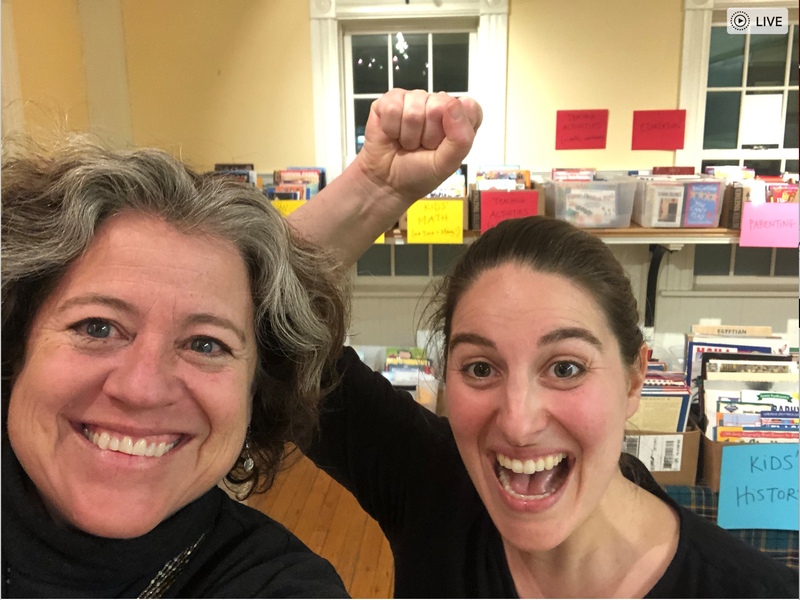 Nota bene: Jory and I took this pic the night before the sale, celebrating the completion of set-up, but it’s how we felt at the end, too. Wahoo! 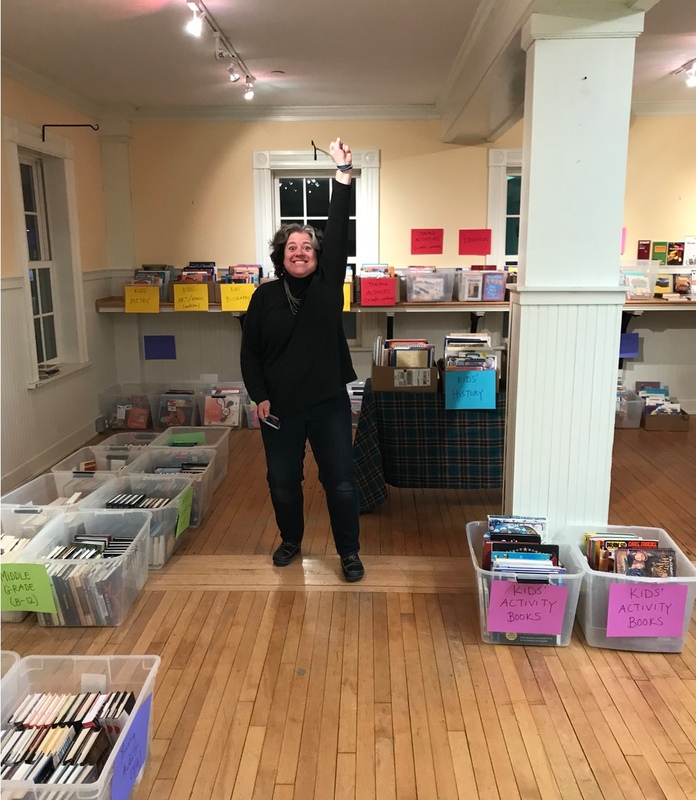 Huge thanks to Jory, and also to Liza, Laura, and Heather, who did so much work on this event, and to the rest of my staff for making it possible! This entry was posted in Uncategorized on April 2, 2019 by Elizabeth Bluemle.